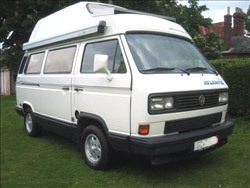 The purpose of this website is to provide a photo gallery of the many types of Volkswagen Camper Van and Volkswagen Bus including Splitscreen, Bay Window Type 2, T25 / T3 / Vanagon, T4, T5 and LT.
Hopefully the site will be an interesting read for all VW Camper and VW Bus enthusiasts as well as a useful source of reference when details and photographs of a particular model are required. To see the VW Camper Vans and Buses currently in the gallery please Click Here. 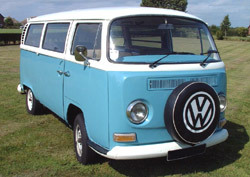 Please help make this a great site by submitting photos of your VW Camper Van or Bus now ! We would like to have images of all types of buses from rat look to pristine original, from working bus to customised show winner. 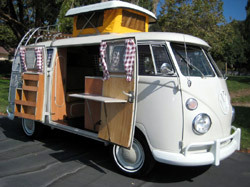 Please submit photos of your VW Camper Van or Bus using the Photo Submission Form. Visit our Links Page to find some useful and interesting Volkswagen Camper and Bus related web sites. And if you have any feedback or suggestions feel free to Contact Us. Copyright 2006 - . All rights reserved.